August | 2010 | ___is black the new black? Whilst looking for an easy appetizer recipe, I stumbled across a page I’d ripped from my Gourmet magazine a couple of years ago. 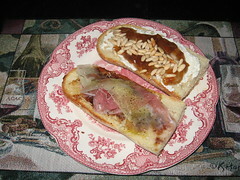 What you see below are 2 of the recipes for tartines (open faced sandwiches). On the bottom is the Ham, Manchego, and Fig Tartine, which was utterly delightful. Savory, sweet, and salty all at once. Above it is the Ricotta Tartine with Spiced Marmalade. Both of them were incredibly easy to make and really perfect on a night when cooking is the last thing on my mind. I had these with a green salad and a glass of wine. I’m sure these would make great appetizers as well (in fact, I think that’s what they’re meant to be).